A month not of dramatic improvement, but of improvement regardless. All of this is a parcel of work, or four parcels, but fortunately I don't have that many cases of heat-responsive substances. (I can ignore rocks and steel tools, for example.) Each rulebook only has to cover ten or twelve cases. All game design is exponential explosion -- but if you can keep the exponent down around -0.3 or -0.4, the series sums to a finite value and the process eventually ends. 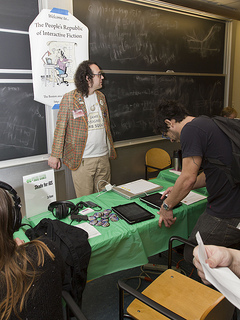 I was at the Boston Festival of Independent Games and it was pretty darn awesome. Meanwhile was also popular, of course. It demos very well -- hand it to someone, and they'll get the idea instantly. Last night I finished an epic -- for me -- drive through Darksiders 2. I've been playing it for two weeks now. (It was my self-reward for the last HL milestone.) I think the counter on my save slot reached 36 hours. I know that's not large for a modern RPG, and weighs as a feather in the MMO world, but I don't play those genres much; for me, this is an enormous game. Fortunately for me (I count my ambivalence quietly), the immersive, 3D, explore-puzzle-fight genre is in a gentle recession these days -- at least on consoles. I suppose its golden age ran from Tomb Raider to Sands of Time? There have been some excellent ones recently, mind you; Arkham Asylum counts, Bioshock counts, and we shouldn't neglect the finely-written Enslaved. But, again, those were rather smaller. I won't expect to burn this kind of time again until (presumably) a Darksiders 3 appears in (presumably) three years or so. My first comment mirrors what I said about the original Darksiders: The writing is adequate. The acting, ditto. The plot is an overcomplicated mess, floating in a tepid goulash of Milton, Revelation, and second-string Vertigo. The characters are stock cardboard ("oh, look, a big grim muscleman") and every single game mechanic is lifted from an earlier game. But so what because the level design and puzzle construction are the best all-around work in the genre. I am happy to announce that I will be showing off Shade for iOS at the Boston Festival of Independent Games, at MIT next weekend. I will also have Meanwhile, Pocket Storm, Fealty, and the rest of my iOS portfolio ready to demo. More IF stuff at FIG: Jason Scott will be a keynote speaker, and he will be showing Get Lamp at some point. Plus there's this whole showcase of other indie games. It'll be cool. What, you ask? Shade for iOS? It's still in development -- don't go running off to the App Store to find it. As with Dreamhold, I'm planning to leave the game file unchanged from its circa-2000 release, but I will add in-game feelies of some sort. Only not a map. A map of Shade wouldn't be very interesting. 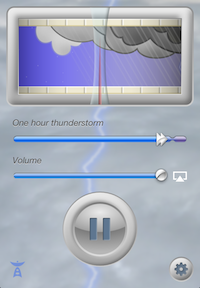 I am delighted to announce Pocket Storm -- a generative audio environment for your iPhone, iPad, or iPod touch. Pocket Storm is my first Boodler project for iOS. It starts with a calm summer night. Soon you'll hear thunder in the distance, then wind and a spatter of rain. After half an hour you'll be in the thick of the storm. By the end of the hour it will have faded into the night again. Then the cycle begins again. The Pocket Storm is not like other environmental audio apps. Every thunderstorm is different! Wind, rain, thunder -- even chirping crickets -- every sound is chosen from a library, with subtle variations of pitch and timing. The Pocket Storm weaves these elements into a tapestry of sound which will never repeat. Here's my Pocket Storm web page; or snarf it straight from the App Store.